These images by award-winning local photographer Robin Stewart were taken at Tuxford and Tebbutt Creamery in Melton Mowbray, one of only five creameries in the world licensed to produce Blue Stilton – the ‘King of English Cheeses’. 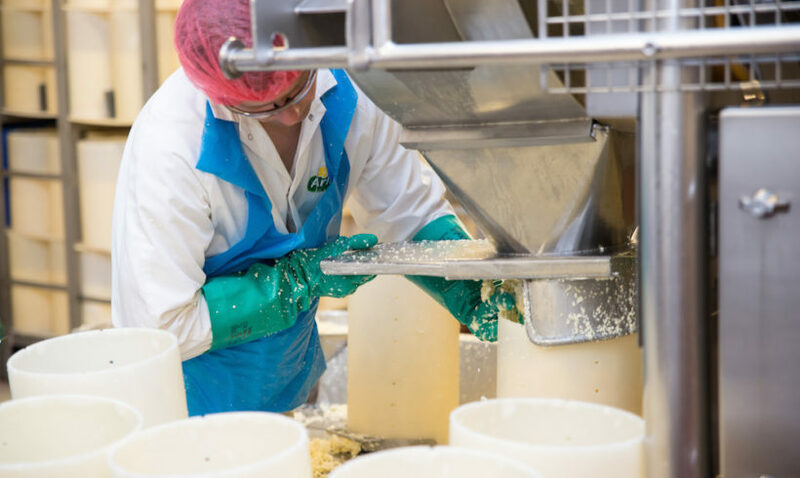 The picture above shows curds being poured into the molds, ready to firm up. The molds are perforated to allow the skewers to be inserted, which ensures the cheese gets those all-important blue veins. The photo below shows Tuxford and Tebbutt’s cheese taster checking for maturity. Robin was using a Nikon D800, with Nikon Speedlight, Tamron 24-70 f2.8 @2.8, aperture priority. “I always use aperture priority for shots like this and manual priority for full control when I’m using a tripod,” says Robin.